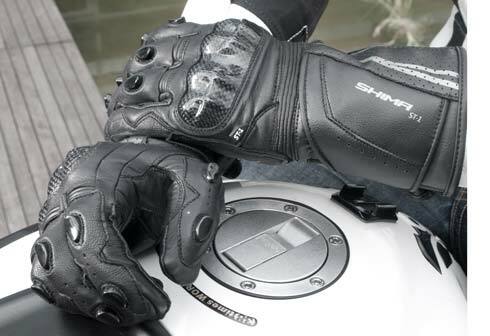 The SHIMA ST-1 is a glove designed both for everyday and sports riding. A set of protectors ensures your safety, while a comfortable cut will make you forget you ever put them on. The fingers feature additional TPU protectors. By using external seams, we can be 100% control our movements on the grip. In addition, we avoid the problem of uncomfortable stitching, because they are out! The ST-1 is a sporting glove which ensures a supremely precise and tactile grip while maintaining a high degree of safety. The glove features comfort-enhancing outer stitching on fingers, Poron®XRD™ impact absorbers on the fingers, knuckles and wrist, and a carbon fiber reinforced protector. Additionally, the fingers also feature TPU protectors, and the side is reinforced with an extra layer of leather. Imagine that up to 90% of impact force never reach your body. Sounds good, right? That’s because of high performing foams that rapidly hardens under the impact making kind of “forcefield”. On the other hand on molecule level material is able to re-distribute the impact force in many directions so the impact that gets out is dissipated on much larger area. Hard fingers protectors provide additional protection in case of slide and impact. Reinforcement panels placed on palm and/or side hand provide additional abrasion resistance and improving overall protection performance. Additional layer with improved grip performance for easier and more precise shifter handling.